The brainfather of Boston’s ice industry was Frederic Tudor, about whom I have learned a great deal from The Ice King: Frederic Tudor and His Circle. Highly recommended, if you’re into half-forgotten New England history. The book came as a bonus with membership in Mystic Seaport, a terrific maritime museum down the road on the Connecticut coast. Google guys..how about a cash prize for the first guy that gets a working space transportation system..manned rocket…into orbit…not just a we think it might work (Elton Musk)..something that Pete Conrad would have appreciated…when you get lemons make lemonade…. Your photo reminds me of my childhood outside Boston, in Medford, where we skated most afternoons. I wrote about it once upon a time for the Atlantic, and your photo prompted me to retrieve it and post it on my site: http://journalismprofessor.com. As for the pond/lake issue, as a native I was always told that the way you could tell a lake from a pond is that a lake has a river running into or out of it (like the Mystic Lake, two blocks from my old house), whereas a pond does not (like Brooks Pond, where we did our skating). 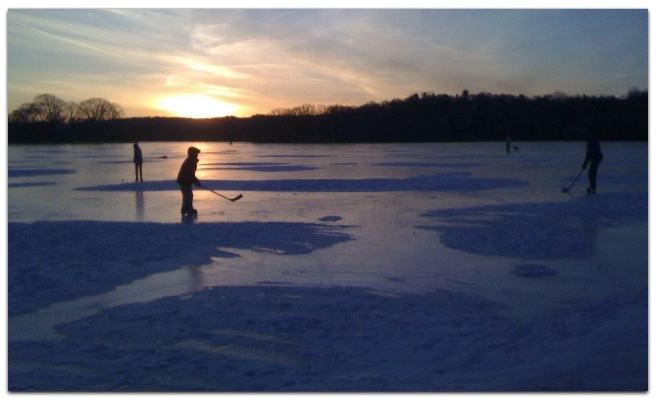 In winter, ponds were preferred for skating because there was no flow through them. With no flow, the water stood still and froze more readily. We were told to take extra precautions on a lake. It’s a useful distinction, but apparently not one that experts have taken to. I now live in Newton near Crystal Lake. It’s not a lake by the traditional, folk definition, and that bothered me when I first moved here. Then I found out that the lake used to be called Baptist Pond, back in the 19th C., when it was used for baptisms. According to local history, in the late 19th C., some folks wanted to cut the ice for the ice trade, and they realized that it would probably not have much marketing appeal to identify it as coming from Baptist Pond. So, the ice company changed the name to Crystal Lake. So you’re from Medford. Did you know Billy West, by any chance? He’s a fellow former Medfordian, and likes to say that “Meffer” gave its Ds to Sesame Street. I had always thought that ponds had little or minimal moving water, and were smaller and more shallow than lakes. And it could be that it seems every big puddle around here is called a pond because, well, nearly every one of those is a pond, in the literal no-outlet sense. All of them were left here at the dawn of the Holocene. Geologically speaking, that was a few hours ago. Very interesting about Crystal Lake. I guess “Crystal Pond” was less box-office. 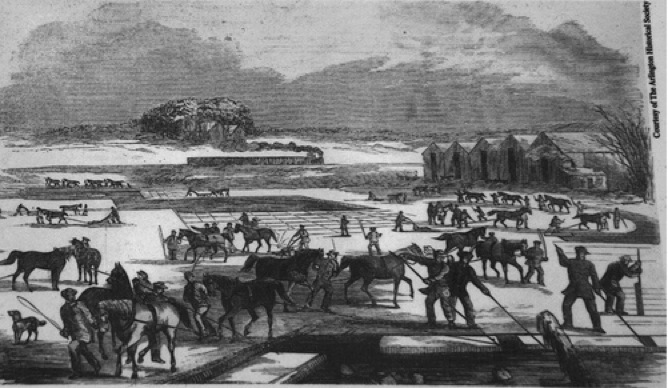 An interesting climate-change item: Many small lakes (few are called ponds, even if they are) in North Carolina still had ice houses nearby, going into the last century — because they farmed ice there too. … and I’m beginning to believe we could again. Brrrrr… But at least our drought in NC is more than over and all the farm-dug livestock ponds will be full. If you want to see ice harvesting in action, arrange a visit to the Museum at the Jason Russell House (http://www.arlingtonhistorical.org/) in Arlington. They’ve transferred an old film of ice harvesting on Spy Pond to DVD and can play it for visitors. It brings that Wikipedia image to life. Give them a call, or send an email in advance. I know they’d be happy to do it (my spouse is the museum administrator). They’re located on Mass Ave a couple of blocks from the bike path in Arlington Center. I am a noob to the Boston area as well, and Spy Pond is visible (just) from our house. I was amazed the first time I saw that someone had cleared a space on the pond for skating. And then I saw a guy on racing skates when I went to the pond with my son. And with the conditions as Doc reports, the skaters were out in force over the weekend. Even a skate-sail boat. For people who don’t know it, Spy Pond is quite large. 103 acres, according to that wikipedia entry. Thanks, Jack. I saw a couple of little kids speed-skating there this morning while I was driving up the Concord Pike. Is school out, or are these kids enjoying a form of home schooling? Either way, looked like fun. I used to cover ice yachting on Greenwood Lake. This was at the turn of the 70s, almost 40 years ago. Not sure it’s changed much, except for use of helmets. Went out on one once with a local yachter (racer would be the better term). The things went from zero to sixty and more in what seemed like about two seconds. Then they go up on one runner and lean over to go faster. Scared the crap out of me. And they can go on ice too rough for skating. I think you need a bigger ice body than Spy Pond, though. Great to find your blog. Fascinating, insightful and pleasurable read. Mazel tov. Linking-the miracle of the web.